Joshua is a highly qualified practitioner with a Bachelor of Chiropractic Science and a Masters degree in Chiropractic (Macquarie University) and a passion for helping those in need. Dr Joshua Shea (chiropractor) received his first chiropractic treatment at an early age and grew up understanding the correlation between good spinal health and feeling great. Josh recognised that having good spinal movement, free of pain and discomfort made him feel and function well and it was only natural that he chose chiropractic as a career. Josh graduated from Macquarie University with a Bachelor of Chiropractic Science and a Masters degree in Chiropractic and his continued postgraduate studies keep him up to date with the latest innovations in chiropractic and health care. 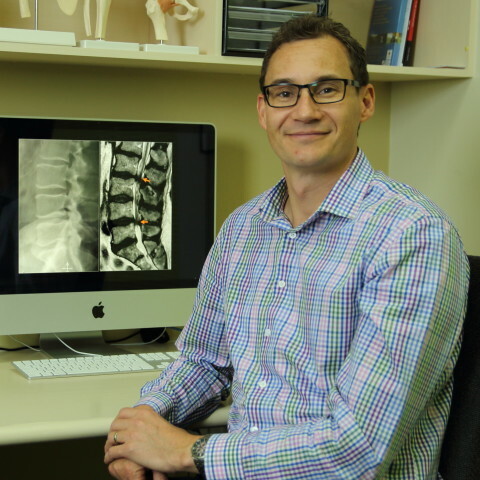 As well as his general practice, Josh has been involved in delivering chiropractic care to sporting teams, including the NBL, local and interstate AFL, rugby league and rugby union. Josh has also had the privilege of working with the Brain Injury Foundation to help people with various brain injuries. Josh is proficient in sacro-occiptal (SOT) technique, Thompson technique (drop piece), torque release technique (TRT) and various other extremity adjusting techniques such as shoulder, elbow, hand, TMJ, hip, knee, ankle and foot. This enables him to manage everything from minor aches and pains to the more complex issues that BodyKey Chiropractic attends to everyday. Josh was born in Canberra and grew up in Queensland. After graduating, Josh practiced in Canberra for 8 years. He has recently moved back to Brisbane with his wife Hannah and their 2 beautiful daughters, Stella and Amelia. Josh loves the outdoors including most water sports and anything that involves a little bit of speed, (especially his dirt bike). Josh is a member of the Chiropractors Association of Australia. For an appointment with Dr Shea call BodyKey Brisbane chiropractic on (07) 3878 1110, or visit us at Suite 1, 60 Coonan St and discover the freedom to live your life as it should be enjoyed! Bodykey Chiropractic is a modern allied health service solution in Indooroopilly. Offering Chiropractic, Kinesiology, and Massage to treat a range of ailments. Chiropractic care for Back Pain, Headache, Neck Pain,Sports Injuries and much more. Contact us today to see how we can help. BodyKey Chiropractic Indooroopilly © 2019 All Right Reserved. Visit us at Suite 1, 60 Coonan Street Indooroopilly QLD 4068. Our opening hours are 7:30am - 11:30am and 2:30pm - 7:00pm Monday - Friday, and 8:00am - 11:00am Saturday.